For many Americans, the summer grilling and travel season begins this weekend. 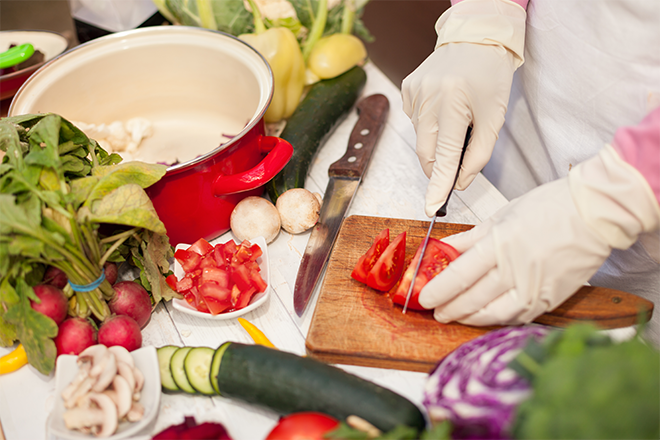 The U.S. Department of Agriculture's Food Safety and Inspection Service wants to make sure you and your family avoid food poisoning this summer. An estimated 128,000 Americans are hospitalized with food poisoning each year, but foodborne illnesses can be prevented during summer months by properly handling perishable foods during travel, and by using a food thermometer when grilling. If you're traveling to your favorite grilling location in a local park, or simply grilling in your backyard, perishable food items, including raw meat and poultry, need to be handled safely before they hit the grill. Bacteria grow rapidly in warm temperatures, so perishable foods need to be kept at 40degF or below to reduce bacterial growth. Perishable foods that are held above 40degF for more than two hours should not be consumed. In hot weather (above 90degF), food should be discarded if it sits out for more than one hour. The best way to keep food cold during the summer when you're away from home is to use a cooler. Consider packing beverages in one cooler and perishable food in another cooler. The beverage cooler may be opened frequently, causing the temperature inside of the cooler to fluctuate and become unsafe for perishable foods. Prevent juices from raw meat and poultry from cross-contaminating other items in your cooler by placing raw meats in waterproof containers before placing them in the cooler. 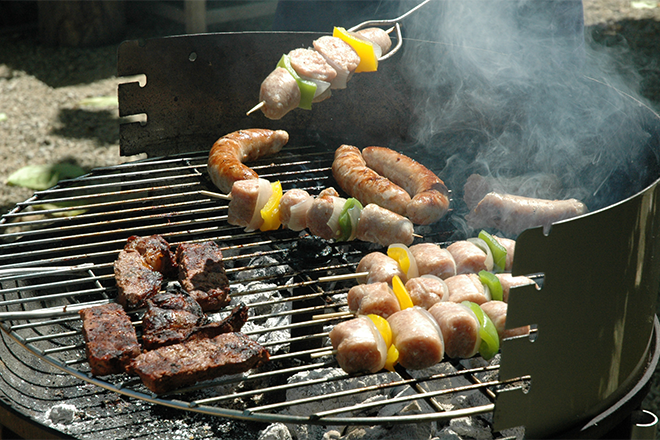 Meats and kababs cooking on a grill. Wikimedia - DimiTalen. Two sets of cooking utensils (tongs, spatulas, forks, etc.). Use the first set to handle raw items and the other for cooked foods. Plates or containers for cooked items. Never place cooked foods on the same plate or container that held raw meat or poultry. Once finished, make sure all leftovers are refrigerated or put on ice within two hours after cooking, or one hour if the temperature is above 90degF. Leftovers should be consumed within three to four days when refrigerated.